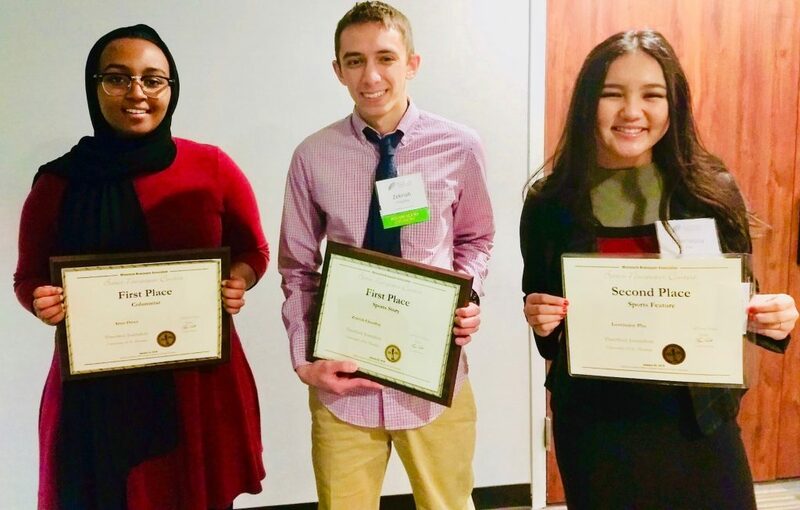 ThreeSixty Journalism is excited to announce three students were honored at the Minnesota Newspaper Association Awards on Thursday, January 24, 2019. The students were joined by their families for a dinner celebration at the Awards Banquet in Bloomington. ThreeSixty alumni Anne Omer, Zekriah Chaudhry and Loveisajoy Pha display their MNA College Better Newspaper Contest awards. Two students earned the top recognition in their category, while another student placed second in the College Better Newspaper Contest, which is a college-level competition. However, our high school students’ work is eligible and competitive with college students. The winners all wrote their stories as seniors in high school and are now attending universities across the state. Anne Omer, ThreeSixty alumna and University of Minnesota freshman, earned a first-place honor as a columnist for her college essay, Telling My Story, Without a Costume. Another alumna recognized at the event was 2014 ThreeSixty Scholar Deborah Honore. She took first place in the multimedia category for her story, As Syrian Refugees Resettle in Minnesota, Student Parallels Her Journey from Ethiopia. The video appeared on TommieMedia, which is the student news organization on campus.